Links for the Beginning Knitter | Knit Like You Mean It. 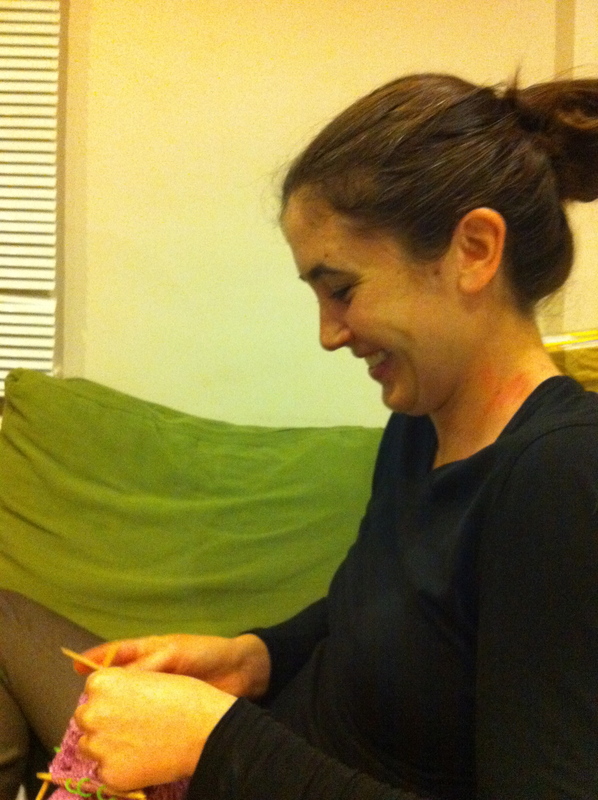 A Very Good Sport: Mallory learning to knit a hat, using DPNs, even. I didn't tell her they were hard. But I had underestimated the addictive quality of teaching people to knit, especially beginners. I love watching people go from non-knitters to knitters. It’s especially fun to teach hats, because they can be completed relatively quickly, and there’s nothing more exciting to a new knitter than a completed project. And poor Mallory walked right into this gaping maw of knitting teacher need about a month ago. She’d knit a scarf before, but that got repetitive and boring. Aside: I do wish we could come up with a better first project than a scarf. Maybe a kerchief (head or neck) or a seamed cowl would work. I know exactly why we have people knit scarves – lots of practice, big long rectangle – but I have had so many people come into my classes who learned to knit long before, got bored with their scarves, and almost never came back. I myself learned to knit a few little squares, and then socks. But that’s another story for another time. First hat! Check out the excitement on her face. Anyway, the sentence “I might like to knit sometime” was barely out of Mallory’s mouth before I was racing upstairs to grab yarn and knitting needles before she changed her mind, Mr. Trask cheering me on as he saw another opportunity for me to give away yarn. We started with a simple ribbed hat made of leftover pink yarn from my Tea Leaves Sweater (which, by the way, turned out just fine, and I really should post a photo or two). 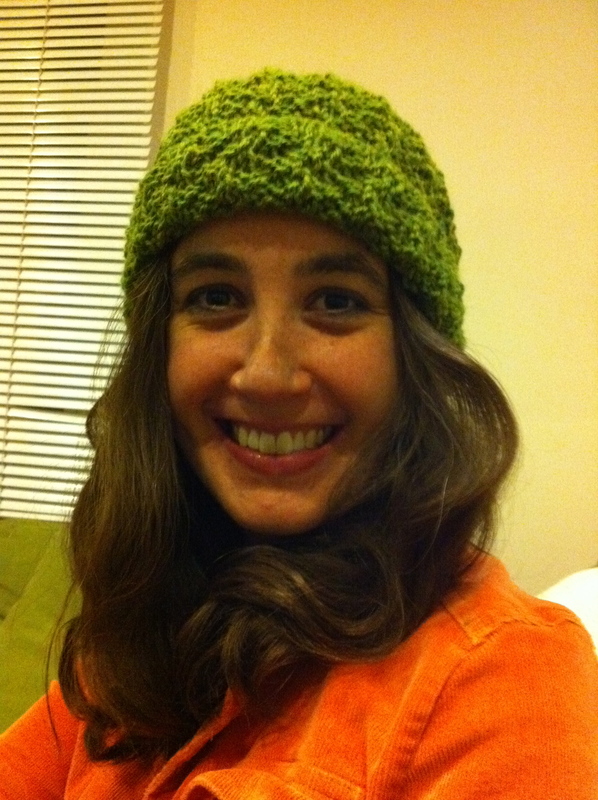 Then Mallory had the nifty idea to make a wavy hat, shifting the ridges of the ribbing every row or so, and we found some delightful green yarn in my stash. Then I lured her back to scarves with the Irish Hiking Scarf, a simple cabled number, and now she is working on a top-down sweater by Stefanie Japel. We made her first foray into yarn shop joy a couple of weeks ago, dropping in to Port Meadow Designs for some gorgeous Mirasol yarn for her sweater. Mallory's second hat - with a pattern she improvised herself. I’m luring her even further into the knitting abyss by convincing her to make an Albers Cowl while working on the sweater (you know how nice it is to have a mindless project as well). Soon, she will have two projects on the needles at once! A rite of passage indeed. Anyway, I thought now might be a good time to post some links that I usually give out in my beginning classes. And I got all excited about the internet and found some other items as well. Here’s what I came up with. What would you add to the list? 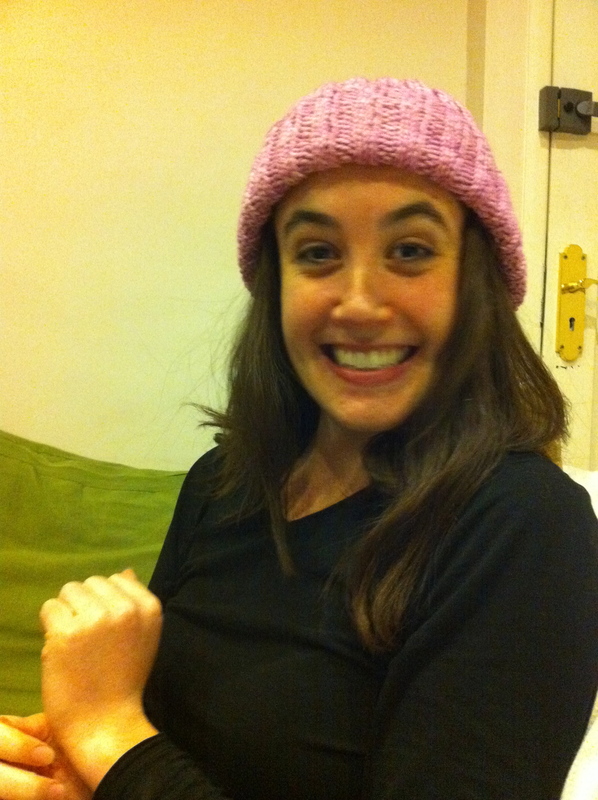 One last thing: I know you all are wondering what happened to the pink yarn left over after Mallory made her first hat. Right? Right? The answer is that it became my first baby project. I know, I know, I said the first project would be out of the Alisha Goes Around, but you all gave me so many choices for that yarn that I still haven’t decided. Also, this yarn was pink. And we’re having a girl. So the last bits of this yarn seemed destined to go to her. 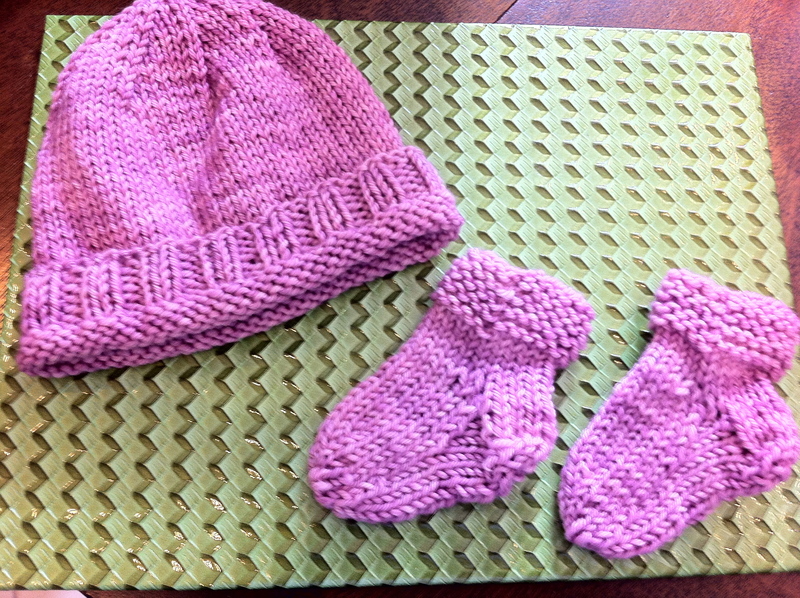 A little hat and little socks, for the little girl who will come in July. And here are some links to help the beginning, and not-so-beginning, knitter. Ravelry. A knitting and crochet community with all kinds of information on yarns and patterns, plus forums in which many helpful knitters will talk to you about a variety of subjects (some even having to do with knitting). Knitting Help. Videos of any stitch you might be able to think of, and other techniques as well. Knitty. Free patterns, articles, general fun. Encouragement. A video of a guy teaching himself to knit. Spoiler alert: it does not go well. How Much Yarn for a Long-Tail Cast-On? Cat Bordhi shows us. How Can I Find the Right Yarn for this Project? Clara Parkes offers tips. Why Do I Have to Knit a Gauge Swatch? Jenna Wilson settles this once and for all. Teen Granny has organized Knit Relief, an eBay auction of hand-knit items to support Sport Relief. An appeal for hats for newborns, via Doctors Without Borders. Not feeling creative? The post includes two hat patterns. A pattern from The Guardian to make blankets for rescue dogs (and information on where to send them). 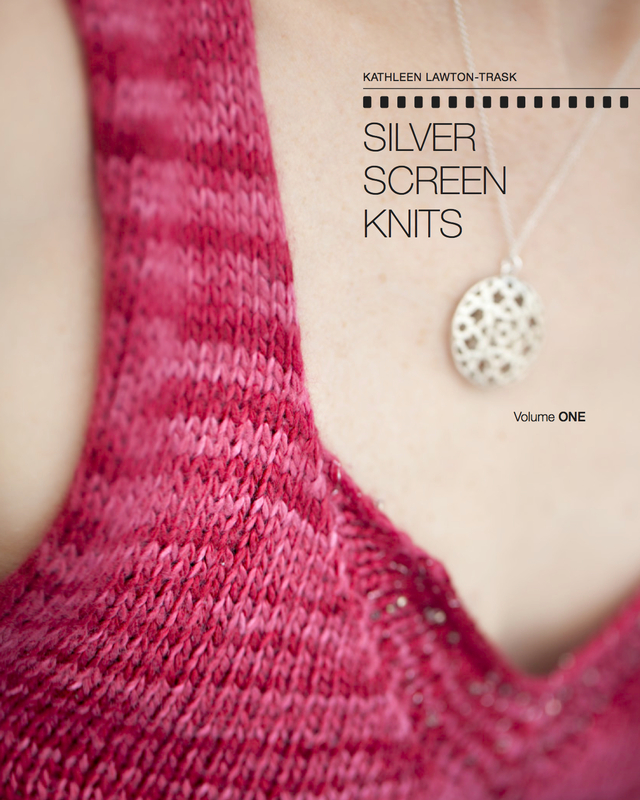 Clara Parkes Reviews Knitting With Two Colors by knitting legend Meg Swanson and Amy Detjen. Note to Mr. Trask: post includes links for where to buy online. Lara Neel of Math4Knitters is posting an index of sorts to the new book Principles of Knitting on Twitter, using the hashtag #PoKLove . Check it out! An Infestation of Gnomes at Mochimochiland. A Man Wearing a (fake) Fox Head, Cross-Stitching. Omar Little Is Most Electable of “The Wire” Characters. What a cool post! Everything you always wanted to know about learning to knit but were afraid to ask….. just awesome. I’m in foggy Baltimore today and mulling over which yarn store to discover. Ok, I’m really in Timonium. P.S. I love your little pink knits for l’enfant. Very helpful and great job Mallory! Loved the Encouragement video…it made me feel quite advanced and superior! I think scarfs are terrible projects for beginners. I nearly quit over my first one. I’m thinking that pot holders are the perfect size for first projects – they’re useful, they’re small, they include the basic three, same as a scarf: cast on, cast off, knit back and forth. Also, they double as tension swatches, as pattern swatches for not too large patterns (like a lace repeat or double knitting), knit on the bias allow you to practice increases and decreases, and flat round ones for learning to knit flat circles from the middle out (or the outside in). The only thing I don’t see them for is learning to join in the round, and that’s where hats come in. Lynda, this is an excellent idea. I can’t recall what my first project was supposed to be, but it could well have served as a pot holder. I meet lots of second-time beginners who quit the first time over their scarves. Long live the pot holder! Love, love, love the pink hat and socks for “the little girl who will come in July,” aka my granddaughter! So cute!!! I am halfway done on the blanket and knitting, knitting, knitting! Aw, shucks…thanks, Consuela(la)! I have always thought that class might do better with an extra half hour, or an hour meet-up the following week. I’m glad that you hung in there with the DPNs! Thank you very much for sharing our appeal for baby hats. We also have knitting patterns to raise money for Doctors Without Borders, including a few aimed at beginners which are not scarves. Finally, welcome to the UK. I hope you settle well and enjoy living here.